This past weekend many surprises were shown at the D23 Expo, however a gameplay feature that's been missing from the past few trailers has been the confusing but stunning Attraction Flow system. "During the talk Nomura commented that Kingdom Hearts III will offer various ways to attack enemies, such as Keyblade transformations, magic, melee attacks; and Attraction Flow is just one more weapon in the arsenal of attacks the player can use to their advantage. "In this sense, they do not want to force you to use only one type of attack, but you are given the option of enjoying Attraction Flow System with its brilliant and amazing animations, in other words, a colorful presentation without button mashing. You can enjoy a visual treat on the screen. "The most interesting thing that Nomura said about it, is that the user will have no say over the type of Attraction Flow they activate, but rather they will be a surprise depending on the area. This way when you see that the indicator is ready to run the showy power, you will have the surprise of discovering what will happen and it's not something you can simply rengage in any environment you choose." So, what do you think? Will you let yourself enjoy the random rides of Attraction Flow, or do you imagine you'll stick to other attacks under your control? You can read the original untranslated article here. Kingdom Hearts III will released in 2018 on the PS4 and the XboxOne. Not a fan of everything being random or based on building a bar. Eh, random attraction flows could be a major inconvenience during gameplay. Especially during a boss fight when you don't get the one that would be beneficial. That makes sense with huge rides like Big Magic Mountain, but a little disappointing with smaller ones like the space shooter. Also, I remember that both the tea cups and the pirate ship Attraction Flows were used in Twilight Town's tram common. Could it be possible for areas to have more than one ride at the same time...but random? Or was it just something for the trailers? Didn't really understand, will they just randomly be activated or will there be a random prompt? Like, will they be Situation Commands? Not a fan of random stuff. From what I understand it seems that you choose to activate it, but the Attraction is random depending on what map/part of a map you're in. Which. Weird. But I at least hope it means the Attraction will always be useful for the battle you're using it for. Hmm we did see the pirate ship activate in that pond in A trailer. I don't think it will be a complete random factor. Mhâ€¦ at least that's better than it just randomly activating. Now I can just ignore this. I don't know how to feel about that at all. I really don't like random stuff in games, since I like to be in full control instead of having to depend on the game itself. On the other hand, though, the attractions themselves seem kind of fun. Hm. Don't see any problem with it being random. We have so much already in attack methods with drive forms, keyblade transformations, magic, and attraction flow. I don't need another method where I have ten different things to pick from in battle. I like options but I don't want too many options. Just ignore the attractions/options/mechanics you don't want to use, then? It'sâ€¦ as simple as that, really. I don't see how 'too many options' could bad if you can just ignore most of the stuff you don't like. Now what if you get one that you don't like at all, one that's totally useless? Won't you be like, "man, I wish I could've just chosen the other one"? I dunno, I just really hate RNG stuff. Drive Forms and Keyblade Transformations are essentially the same thing, by the way. Well as long as they damage enemies, I suppose getting the wrong flow wouldn't be too much of a hassle. I'm not one for randomness, but it seems like it's a Situation Command where you choose if you want to use it or not. But, it's seeming more and more that the game won't require as much thought as before with KH2FM (talking critical here). I just hope that advanced strategies are maintained and it's not all about flash. 2.) Certain conditions have to be met like FINAL FANTASY XV's Summons (Titan you need a VERY open space; Leviathan near water). I'm willing to bet it'll be #2 because of how I imagine KINGDOM HEARTS III will feature a lot of Versus XIII material. This was my immediate concern. I'm really hoping there's more to this or I can at least SEE which attraction flow I'm about to activate before I'm stuck in something I don't want to. hasn't hit me this is reality yet, regardless of the grammar =p. So better hope it doesn't come up when you want to Keyblade transform. I feel like by random it could mean what is around, or what kind of enemy. Like, I could never see Big Thunder Mountain activating on normal enemies, only giant ones. And then I know the last time we saw the Pirate Ship it popped out of the little lake in front of Rapunzel's Tower, so I wondered if it may only pop out of water? I could see stuff like this...like you get what the legit environment entails. Except, I can't see what the Astro Blasters or Teacups would need. Sounds interesting, can't wait to see how it works out I guess. Not sure if I got it correct but... I think Nomura meant that Attraction Flow can be only activated in specific battles/map parts by the player's choice. Though I'm not sure if the Attraction itself is random or not. This could be amazing or terrible and sounds like a more fleshed out reality shift system honestly. Something like this was in FFXV with the summons. Different ones appeared depending on the area you were in (water one couldn't pop up unless there was nearby water for instance, 'earth' one mostly appeared when you were in open plains) and then there were other criteria on top of that like how long the battle had been going on, if any of your allies were hurt critically, if you yourself were critically hurt. The combination of those things determined which summon you were able to use. Well, since it's completely optional and you can choose to trigger it or not I have no problem with that. I do think I'll try them all out of curiosity, but won't be using them otherwise. Not really my thing, I'd rather fight the enemies myself. I'm kind of glad actually that they've made it area specific and not something you can use at any time anywhere. We'll see how it works but as of now I don't mind this. depending on the area", which makes me think this will be less CoM Donald random (the bad random), and more like FF III's Geomancer random (the good, "strategic" random). Let's just hope that's the case. Again, considering is Osaka, everything that doesn't lead to having a broken option always available I'm down for. I'm jst glad to see that Attraction Flow and Summons are unrelated. My fear was that attraction flow would be replacing summons. Glad to see that's not the case. As far as Summons are concerned, I'd really like to see some FF summons this time around. Bahamut was planned to be in the original KH1 and I think KH could do with a little more FF influence. To me, it's the "serious" side of the KH mashup, and the one I personally enjoy more. So it's not like pure randomness, but the percentages vary upon location, with the possibility of some locations having only one Attraction appear. So for example, Magic Mountain might have a 30% chance while in Thebes, but 100% when fighting the Rock Titan. And given that Nomura described Attraction Flow as "
a colorful presentation without button mashing. You can enjoy a visual treat on the screen." it sounds like Attraction Flow is an invincible attack with little to no input, so even if you don't get the one you wanted, the randomness doesn't appear to be detrimental. Yeah that's what I meant. I fully understand the fear and concern over the term "randomized" in videogames, but not all of its implementations have to be bad. I'm actually fine with this, at least from the information we've been given. I think it's best to think of Attraction Flow as one move, but just with a variety of animations so it doesn't get stale. Regular melee attacks, magic, drive forms, summons, attraction flow, Flowmotion.. I'm getting the feeling Sora is powerful enough as it is.. but with the reminder of yet another mechanic to throw in the mix, I feel maybe they're cramming in more ideas than need be? 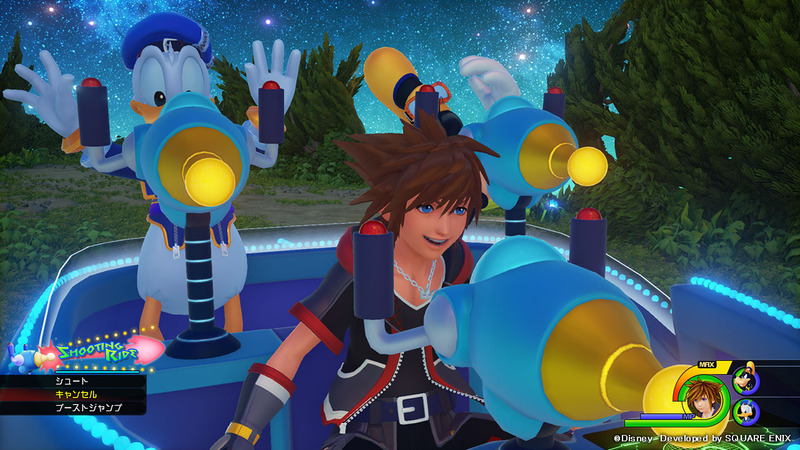 The rides look very good of course, but I sure hope the heartless are beefed up as well to suit all these mechanics. So far, the heartless in the past trailers seem to just be running around, not really putting up much of a fight. The speedrunners are gonna freak.